SAN DIEGO–(BUSINESS WIRE)–RippleNami, Inc., a provider of a map-based data visualization platform accessed via the cloud, announced today that the board of directors has appointed Jaye Connolly-LaBelle president and chief executive officer and Kendra Berger chief financial officer. Connolly-LaBelle served as RippleNami’s president and chief operating officer from March 2015 to January 2016 and was promoted to assume the CEO role, effective immediately. She succeeds Bill VanDeWeghe, who will remain on RippleNami’s board of directors as its newly appointed co-chairman. Connolly-LaBelle brings a 30-year proven track record for both turning around as well as building successful companies, specifically those engaged in the disruptive technology arena. Her expertise lies in strategic direction and oversight of senior management, operations, finance, mergers and acquisitions and business development. In her new role, she will oversee management of the Company including operations, sales, marketing, finance and development. Prior to joining RippleNami, Connolly-LaBelle was president and chief executive officer at PathCentral, a medical technology company in the global pathology space. She turned the company around and helped position the sale of its assets and intellectual property to XIFIN, Inc., a financial cloud computing company involved in healthcare diagnostics. Earlier, Connolly-LaBelle served as president and chief executive officer at A-Life Medical, Inc., the pioneer and leading provider of computer-assisted coding products and services for the healthcare industry, which was acquired by UnitedHealth Group while under Connolly-LaBelle’s management direction. Connolly also was vice president of business development of mergers and acquisitions at InSight Health Corp., a Lake Forest, Calif.-based nationwide diagnostic imaging leader. In 2009, Connolly-LaBelle was named CFO of the Year by the San Diego Business Journal and in 2010, she was cited as the Most Admired CEO by the same publication. She holds a Bachelor of Science degree in Accounting from Texas Tech University. Concurrent with Connolly-LaBelle’s promotion, the Company named Kendra Berger to the post of chief financial officer. Berger, a certified public accountant, is a seasoned financial executive with more than 25 years of experience. She has headed the finance function across a range of both private and public companies engaged in the technology, bio-technology and entertainment sectors. During the course of her career, as a public company CFO, she led a variety of debt and equity financings, mergers and acquisitions, and corporate restructurings while also implementing and maintaining compliance activities customary to those organizations with public company status. Prior to joining RippleNami, Berger was chief financial officer and corporate secretary at NTN Buzztime, Inc., a leading, social entertainment and integrated marketing platform. In this capacity, she handled all financial functions and compliance matters for this publicly traded company. Prior, she was executive director of finance and controller for Nventa Biopharmaceuticals Corp., a role in which she handled accounting, financial reporting, cash management, compliance and several other operational functions relating to finance. She has also held various board seats for nonprofit organizations in the San Diego area. Berger earned a Bachelor of Science degree with honors in Accounting from Ohio University. “As co-founder of this rapidly growing, dynamic technology organization, I am pleased with these leadership changes and excited about what the future holds for our Company. Both Jaye and Kendra are seasoned experts in their respective areas, who bring energy and vision coupled with deep knowledge for growing technology companies to RippleNami. I am confident they will help take our Company to the next level, and look forward to the contributions they will make in their new roles,” said Phil Gahn, RippleNami co-founder and chief business development officer. “I am honored to lead RippleNami as it further embarks on its quest to connect people with real-time, easily-accessible information around the world through cutting-edge technology. I look forward to the positive change RippleNami can affect worldwide through its technology and expertise,” Connolly-LaBelle said. “Furthermore, we are extremely pleased to announce the appointment of Kendra as RippleNami’s new CFO. Her decades of hands-on experience leading both finance and related administrative functions at fast-paced, private companies as well as publicly traded entities in the technology, bio-tech and entertainment industries, make her the perfect candidate for the role with RippleNami and will bode well for our continued success. At the same time, we thank Bill for the efforts he put forth in shaping RippleNami early on including setting the right tone, establishing the right energy and developing the right foundation for success. He has been instrumental in helping with RippleNami’s formation over the past year,” she added. An industry game changer, RippleNami believes that, empowered with real-time, easily-accessible information, people around the world can connect and foster positive change. RippleNami is redefining mapping with the first visualization platform that consolidates big data and provides information that really matters to users and their organizations. The Company’s cost-effective, device agnostic cloud-based platform delivers millions of real-time actionable data points on an intuitive map to customers across enterprises, universities, nonprofits and emergency management agencies, enabling critical decision making and enhanced collaboration. With seamless integration, limitless customization and scalable architecture, RippleNami lets people chart their own world, streamlining communication and improving operational effectiveness. For more information about RippleNami, visitwww.ripplenami.com. San Diego — Tech startup RippleNami Inc. has developed a cloud-based, map-making tool that could significantly improve the way relief agencies, corporations and governments monitor and respond to global events. The app (which can be downloaded to tablets, smartphones and laptops) can be used to chart things such as natural threats and terrorist activity, along with customizable data that’s relevant to an organization’s objectives. It is constantly updated with real-time data that can better equip organizations to make decisions, especially in remote areas of the world. Farrell, the founder of the billion-dollar medical device company ResMed Inc. It has already landed multiple major contracts. The company makes money by charging a subscription fee for its software-as-a-service platform, generating revenue based on a pay-per-multiple-user pricing model. The total value of the contracts, which range from one to three years in length, is paid upfront as soon as the technology is implemented. The company’s first deal was signed (just one month after the technology’s release) with Nuru International, a nongovernmental organization (NGO) that aims to end extreme poverty in remote and rural areas. Nuru is customizing RippleNami’s tool to carry regional information related to health care, financing, agriculture and education to help support 87,000 people who need access to humanitarian aid across Kenya and Ethiopia. Jaye Connolly-LaBelle, president and chief operating officer of RippleNami, said the company is primarily focused on offering the tool to nonprofits and NGOs working in developing countries — especially in Africa. One major reason for that is the high number of humanitarian aid groups that are trying to deliver food, water and other resources to these regions, with few operational tools to make the deliveries go smoothly. Connolly-LaBelle said that many of these groups who are receiving aid are nomadic, moving around so frequently that nonprofits and government organizations lose track of their whereabouts. “Planes loaded with thousands of gallons of water land at deserted sites, and trucks of food literally just rot on roads,” Connolly-LaBelle said. RippleNami’s platform can help NGOs keep track of aid recipients to make these deliveries go more smoothly. Most developing nations have skipped over the landline era, with individuals operating strictly on mobile devices. This means that RippleNami’s app can be installed on villagers’ cellphones so that NGOs can keep tabs on nomadic groups. But more than tracking GPS coordinates, RippleNami’s app can pull in data sets used by agencies such as Interpol and the CIA to track global natural threats, African conflict zones and local terrorist activities. This helps NGOs map out safe landing sites and travel routes. Organizations using the app can also pull in their own data sets, such as the locations of their assets (vehicles, crops, oil, etc.). 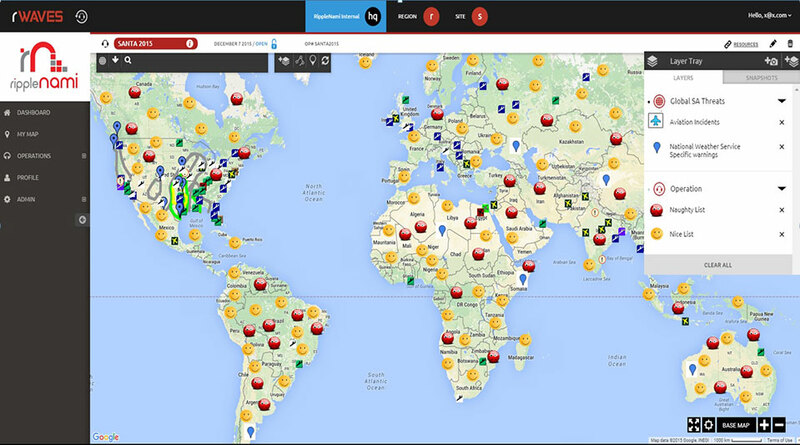 RippleNami’s visualization platform is more than just real-time Big Data refreshing on a map. The app can also be used as a cloud-based, enterprise operations platform. Once the user securely logs in, he or she not only has access to mapped data, but can also upload or access shared documents, RSS feeds, and calendar events. This is especially useful to NGOs and nonprofits (who largely depend on volunteer staff) to share information quickly and efficiently with non-employees. NGOs make up about 56 percent of RippleNami’s potential customer base, Connolly-LaBelle said, with corporations/universities (31 percent) and emergency management operations (13 percent) comprising the rest of the potential client pie. Kenya Power Authority and political parties in Nairobi, Kenya. And in December, RippleNami signed its latest customer, Aero-Pioneer, a provider of air logistics and services in East Africa. Connolly-LaBelle said the company expects several additional customers to sign contracts, including the City of Honolulu, Doctors Without Borders and the American Legion. RippleNami was co-founded by international business development guru Phil Gahn, who now serves as the company’s chief development officer. Gahn has over 20 years of experience leading business development initiatives in South America, the Middle East, Asia and Africa. His experience spans industries including maritime, aviation, mass transit, critical infrastructure security, and law enforcement and defense — most of which took place in austere regions of the world. It was during his time spent working abroad that he saw the need for a tool such as RippleNami. Gahn currently serves as a senior policy advisor for International Security and Crisis Management at the Harvard Medical School’s Operational Medicine Institute, and is a member of the Association of Former Intelligence Officers and the American Society for Industrial Security. Before co-founding RippleNami, Gahn led business development for system integration projects including those for Amtrak, Southern Border Initiative and Texas Office of Homeland Security. It is with this industry experience (and connections) that RippleNami has been able to sign deals with large organizations abroad just months after launching, Connolly-LaBelle said. RippleNami has raised $700,000 in capital from San Diego’s top angels, including Burnham, Farrell, Irving, Gene Ray, Greg McKee, and Ted Roth. The company is currently in the process of raising a seed round. Connolly-LaBelle said that in two years she hopes RippleNami will advance from a business-to-business tool to a business-to-consumer app that’s more directly integrated into daily life. Connolly-LaBelle said the ultimate goal is to sell RippleNami to a company such as Google, who could then take the technology to the consumer. RippleNami’s GIS is helping NGOs and other aid organizations make the most of relief efforts by offering multiple layers of insight into an affected area. Here’s how one organization is making the most of it to support more than 85,000 people across Kenya and Ethiopia. Delivering relief to victims of natural or manmade disasters is, at its core, a challenge of logistics. During his years of work with the US government, Phil Gahn — RippleNami cofounder and chief business development officer — said he saw a problem in logistics. When he went to disaster relief sites, Gahn noted a disconnect whereby the same people, who often didn’t really need resources, received them over and over again. Materials often would be delivered to the wrong spot because data was old. Gahn’s response was to develop RippleNami, a Geographical Information System (GIS) visualization platform that allows users to see information from numerous sources layered on maps provided by Google. As a result, teams ranging from NGOs to multinational corporations can see logistical details in ways that help them deliver products and services safely and efficiently. In a telephone interview with InformationWeek, Jaye Connolly-LaBelle, RippleNami’s president and chief operating officer, spoke of the kind of customers RippleNami has attracted, and the sort of insight they are able to gain through stacking layers of visualized data in the platform. As an example, Connolly-LaBelle cited Nuru International, a nonprofit working to end extreme poverty in remote rural areas. She said that Nuru plans on using RippleNami technology to support more than 85,000 people across Kenya and Ethiopia. Nuru will integrate its proprietary data related to agriculture, financial inclusion, healthcare, and education into the platform to better visualize location-based information. RippleNami layers information from various sources on Google Maps data. That sort of information could be dangerous if the wrong people gained access to it, so security is important to RippleNami. The company uses layers of encryption and authentication to insure that only authorized users can gain access to data sets, and allows customers to specify which of their internal users can see different data layers. In addition to finding customers in developing nations, RippleNami is cultivating customers in Europe and North America. Asked to describe the kind of uses these customers might make of the service, she pointed to real estate firms that could create visualizations of many different quality-of-life factors for customers, showing everything from crime rates to energy and water use in an area where a customer is considering buying a house. **Elite 100 2016: DEADLINE EXTENDED TO JAN. 15, 2016** There’s still time to be a part of the prestigious InformationWeek Elite 100! Submit your company’s application by Jan. 15, 2016. You’ll find instructions and a submission form here: InformationWeek’s Elite 100 2016. This holiday season, Santa Claus is using innovative technology to become even more efficient. He will be using RippleNami, a cloud-based visualization platform, to efficiently and safely deliver presents. Our favorite jolly man is one busy fellow. Not only does he have to keep track of the naughty and nice kids all year long and make the appropriate number of toys and lumps of coal, he then has to visit the homes of children all over the world in a single night. There are many things Santa has to keep in mind as he’s planning his yearly trek across the globe — such as weather conditions, flight patterns of other aircraft, and which homes have chimneys. How does Santa possibly keep track of everything? RippleNami, a cloud-based visualization platform, allows users such as Santa to access data from countless sources and customize information layers into an easy-to-use map. Below is a snapshot of the data Santa can integrate into the RippleNami platform to efficiently and safely deliver presents this year. Weather Conditions — Poor weather conditions can significantly impact Santa’s route. Fog in particular has traditionally been a difficulty, even with the help of Rudolph’s nose. RippleNami allows Santa to track fog in real time, so he knows when Rudolph’s nose is necessary, and when the reindeer can take a break. Aviation Incidents — Santa’s sleigh isn’t the only thing flying on Christmas Eve. Tracking flight patterns and visualizing where aviation incidents have recently occurred help Santa avoid collisions and plan the fastest route. Naughty and Nice Lists — Santa is diligent in keeping track of which kids are naughty and which are nice. He makes a list, and checks it twice! But even Santa could use help planning how many toys versus lumps of coal he needs to pack in his sleigh before the big night. And what if a child who has been nice all year long suddenly throws a fit Christmas Eve? With RippleNami, Santa will be alerted in real time and can pick up some extra coal accordingly. Here is a visual of what Santa sees when he’s using the platform. 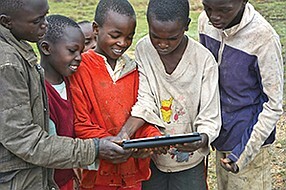 SAN DIEGO, Calif. (Nov. 20,2015) RippleNami, a cloud-based visualization platform, has announced that Nuru International, a nonprofit working to end extreme poverty in remote rural areas, has adopted its intuitive technology to support the organization’s sustainable community development projects. 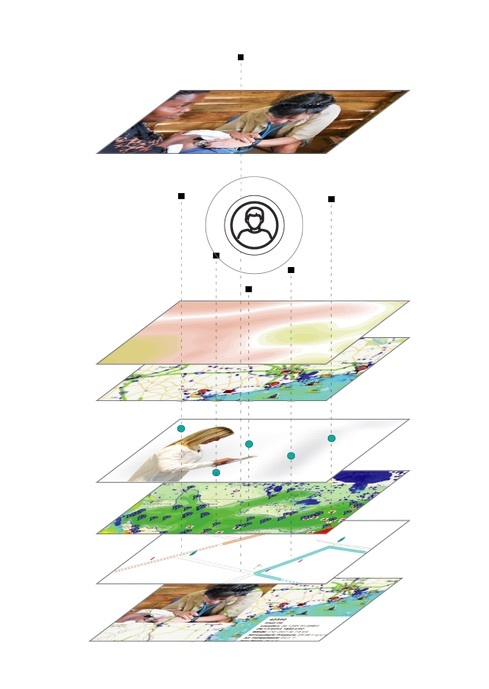 A new and innovative approach to custom mapping, RippleNami allows customers including corporations, NGOs and emergency management organizations to cost-effectively access a wide variety of information that matters most to them in real time, while layering in internal data points relevant to their organization’s objectives. Nuru International plans on leveraging RippleNami’s technology to support more than 85,000 people across Kenya and Ethiopia by integrating its proprietary data related to agriculture, financial inclusion, healthcare and education stored in Salesforce into the platform as a way to better visualize location-based information. Armed with this real-time mapped data, Nuru field staff working with farmer households will have the right information at their immediate disposal to help expedite decision making, track and locate resources and address each community’s most pressing needs. Additionally, the technology will help the organization monitor local crime and regional terrorist threats to protect Nuru staff and farmer households working to help locals rise above and combat poverty. Nuru International equips local leaders in underdeveloped nations in Sub-Saharan Africa with the tools and knowledge needed to guide their communities out of extreme poverty by solving their most prevalent challenges including hunger, inability to cope with financial shocks, preventable disease and death and lack of access to quality education. A primary focus for Nuru is enabling smallholder farmers to increase yields from subsistence to surplus that can be translated into household income. As part of this mission, Nuru will use RippleNami to monitor household food security in its operational area. A cloud-based platform, RippleNami is device agnostic, allowing organizations to assess operations in real-time based on different data sets, overlaying information so it is presented in a clear, easy-to-understand single view. The platform can also be customized for various staff levels, controlling access and distribution of valuable data with specific profiles and permissions. All data and data paths are encrypted and protected with best-in-class data security practices. RippleNami believes that, empowered with real-time, easily-accessible information, people around the world can connect and foster positive change. RippleNami is redefining mapping with the first visualization platform that consolidates big data and provides information that really matters to users and their organizations. The company’s cost-effective, device agnostic cloud- based platform delivers millions of real-time actionable data points on an intuitive map to customers across enterprises, universities, nonprofits and emergency management agencies, enabling critical decision making and enhanced collaboration. RippleNami lets people chart their own world, streamlining communication and improving operational effectiveness. 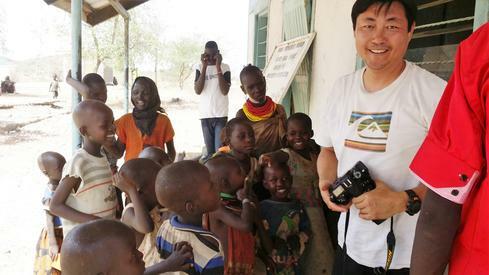 SAN DIEGO, Calif. (Nov. 9, 2015)- Phil Gahn, the co-founder and chief business development officer of RippleNami, a cloud-based visualization platform, has been named a director for the Turkana Child Education Support Programme, a community-based organization that promotes the welfare and educational development of orphans in Northwest Kenya. The primary objective of the TCESP is to support and protect orphaned youth from fatalism, rights abuse and oppression, while providing an environment conducive to their development and growth. Gahn and other directors work tirelessly to provide the children with educational opportunities that enable them to earn a living and escape child labor and exploitation. The organization also provides shelter and basic healthcare to protect these young people from disease and the harsh East-African environment. In addition to appointing Gahn as a programme director, the TCESP has named RippleNami as one of its key partners. With Gahn’s guidance, the directors will leverage RippleNami’s cloud-based visualization technology to track and locate resources, enabling them to better address each community’s most pressing needs. For more information about RippleNami, please visit www.ripplenami.com. For more information about the Turkana Child Education Support Programme, please visit www.turkanachild.org. An industry game changer, RippleNami believes that, empowered with real-time, easily-accessible information, people around the world can connect and foster positive change. RippleNami is redefining mapping with the first visualization platform that consolidates big data and provides information that really matters to users and their organizations. The company’s cost-effective, device agnostic cloud- based platform delivers millions of real-time actionable data points on an intuitive map to customers across enterprises, universities, nonprofits and emergency management agencies, enabling critical decision making and enhanced collaboration. With seamless integration, limitless customization and scalable architecture, RippleNami lets people chart their own world, streamlining communication and improving operational effectiveness. For more information about RippleNami, visit www.ripplenami.com. The Turkana Child Education Support Programme is a community-based organization operating in Turkana County, Kenya to provide children with education, food, water and to foster economic development. It was established in 2014, with aim to provide education for marginalized nomadic pastoralist children. It is sponsored by the Turkana County Government, UNICEF, the International Labour Organization (ILO) and the Kenya Community Development Foundation (KCDF), among others. SAN DIEGO, Calif. (Nov. 3, 2015) – Data mapping company RippleNam said that Nuru International has chosen its technology to support sustainable community development projects. Nuru International equips local leaders in underdeveloped nations in Sub-Saharan Africa with the tools and knowledge to guide their communities out of extreme poverty. Nuru International plans to use RippleNami technology to support more than 85,000 people in Kenya and Ethiopia, by integrating its proprietary data related to agriculture, financial inclusion, healthcare and education. Using this live, mapped data, Nuru field staff working with farmers will have the right informationto help expedite decision-making, track and locate resources, and address each community’s most pressing needs. Additionally, the technology will help the organization monitor local crime and regional terrorist threats. A primary focus for Nuru is enabling smallholder farmers to increase yields from subsistence to surplus that can be translated into household income. SAN DIEGO, Calif. (Nov. 2, 2015)—RippleNami, a cloud-based visualization platform, today announced that Nuru International, a nonprofit working to end extreme poverty in remote rural areas, has adopted its intuitive technology to support the organization’s sustainable community development projects. A new and innovative approach to custom mapping, RippleNami allows customers including corporations, NGOs, and emergency management organizations to cost-effectively access a wide variety of information that matters most to them in real time, while layering in internal data points relevant to their organization’s objectives. A cloud-based platform, RippleNami is device agnostic, allowing organizations to assess operations in real-time based on different data sets, overlaying information so it is presented in a clear, easy to understand single view. The platform can also be customized for various staff levels, controlling access and distribution of valuable data with specific profiles and permissions. All data and data paths are encrypted and protected with best-in-class data security practices. For more information about RippleNami, please visit www.ripplenami.com. Nuru International is a U.S.-based social venture on a mission to end extreme poverty in remote, rural areas. It establishes sustainable community development projects, such as Nuru Kenya and Nuru Ethiopia, to deliver high touch, holistic programming – in Agriculture, Financial Inclusion, Healthcare and Education—to engage all household members in building resilience and ending intergenerational poverty. Since 2009, Nuru has partnered with farmer households to consistently increase crop yields, food security and income. Nuru farmer yields have increased 56 percent more on average than farmers’ yields in the comparison group. In addition, Nuru farmer households have shown a 12 to 14 percent increase in the adoption of healthy behaviors relative to the comparison group since 2013. Moreover, children in grades 2-5 who receive Nuru Outreach have demonstrated a 6 percent increase in literacy proficiency over time in comparison with non-Nuru students. Nuru believes that with access to opportunity and meaningful choices, families can and will graduate from surviving today to planning for tomorrow. For more information, visit Nuruinternational.org, like facebook.com/nuruinternational and follow @IAmNuru on Twitter. An industry game changer, RippleNami believes that, empowered with real-time, easily-accessible information, people around the world can connect and foster positive change. RippleNami is redefining mapping with the first visualization platform that consolidates big data and provides information that really matters to users and their organizations. The company’s cost-effective, device agnostic cloud-based platform delivers millions of real-time actionable data points on an intuitive map to customers across enterprises, universities, nonprofits and emergency management agencies, enabling critical decision making and enhanced collaboration. With seamless integration, limitless customization and scalable architecture, RippleNami lets people chart their own world, streamlining communication and improving operational effectiveness. For more information about RippleNami, visit www.ripplenami.com. SAN DIEGO, Calif. (Oct. 29, 2015) – Jaye Connolly-LaBelle, president and chief operating officer of RippleNami, a cloud-based visualization platform, has been named a finalist for the 22nd Annual Women Who Mean Business Awards. The awards program is presented by San Diego Business Journal and honors women who have made a difference in their communities, blazed a trail for others and are leaving an indelible mark on business in San Diego. As president and COO, Connolly-LaBelle has transitioned RippleNami from an idea to a fully operational, globally expanding company. Using her vast experience in technology and finance, she developed the strategic roadmap that enabled RippleNami to successfully raise angel investments. Since the company’s launch, she has overseen the product and technology teams in developing web and mobile applications and established corporate contracting and development procedures. Prior to joining the executive team at RippleNami, Connolly-LaBelle served in executive roles at both private and publicly traded corporations, leading acquisitions totaling more than $2 billion in revenue. As CEO of PathCentral, a global cloud-based technology and services company, Connolly-LaBelle was able to transition the company from a founder-run business to strategic global growth company, resulting in a successful acquisition of both the laboratory services and technology divisions. She also served as president and CEO of A-Life Medical, Inc., which was also successfully acquired under her leadership. Connolly-LaBelle and her fellow finalists will be honored at a reception hosted by San Diego Business Journal on November 18 at the Town and Country Resort and Convention Center. For more information about the Women Who Mean Business Awards, please visit www.sdbj.com. 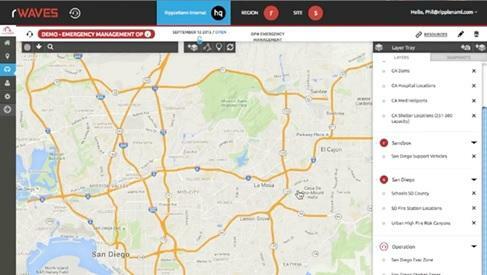 San Diego, CA (June 22, 2015) – RippleNami, the leader in collecting, organizing and visualizing global data, today announced the debut of rWAVES™. Designed to fundamentally change how customers interact with the world around them, rWAVES seamlessly integrates physical and digital information using maps to provide real time awareness, communication and operations anywhere around the globe. With rWAVES, people can now collaborate in real time around the world with improved efficiency and accuracy of information. RippleNami developed rWAVES specifically to meet the needs of organizations working in complex environments with very little relevant or recent information. More importantly, rWAVES intuitively converts a vast amount of unstructured data from the widest variety of sources into a user-friendly interface. In addition to the nimble platform, rWAVES offers users an affordable option. rWAVES is built on a platform agnostic, cloud based system that alleviates the need for new hardware and the costs associated with hiring IT engineers or GIS specialists. RippleNami provides big data mapping solutions that simplify and improve the effectiveness of customer interactions. RippleNami helps individuals, groups, emergency operation centers, corporations, and NGOs around the world track and visualize assets, resources, events and personnel. For more information, visit www.ripplenami.com.